Insect pests can result in substantial losses of stored seed. In West Africa, cowpea bruchids (Callasobruchus maculatus) caused up to 100 percent damage of cowpea seeds stored for a few months (Sallam 1999). Primary pests are those that, in larval stage, feed within intact kernels. Others, such as the saw-toothed grain beetle (Oryzaephillus sp. ), are secondary pests that attack damaged seeds. Elevated carbon dioxide CO2 levels have been shown to kill insect pests in sealed containers (Navarro 2006). Most insects in stored seeds are killed when the atmosphere in the room or container is comprised of 60% or more CO2. Elevated CO2 levels have little or no adverse effect on the germination of stored seeds (Gupta et al. 2014; Navarro et al. 2012). 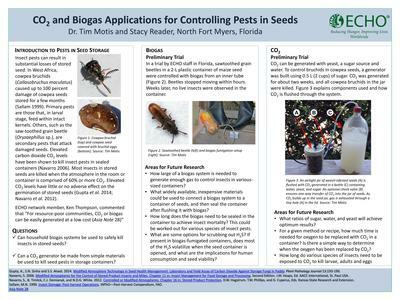 Can household biogas systems be used to safely kill insects in stored seeds? Can a CO2 generator be made from simple materials be used to kill seed pests in storage containers?